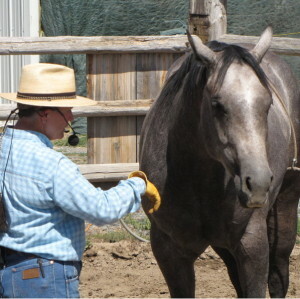 In providing Colt to Horsemanship clinics at the ranch in Oregon for many years, we have learned some very important points that contribute to the success of the Colt Starting experiences. Most important is the reality that the human participant simply must have a good basic foundation in their horsemanship and be willing to go ever deeper in their understanding. There are many wonderful outcomes, both physically and emotionally, to starting your own horse. There is a satisfaction from knowing that you have developed all the buttons on your horse. A lifetime connection comes from creating experiences together from the very beginning with a colt. Moreover, maybe the most awe-inspiring attribute is the true spirituality found in developing a partnership. Starting a horse is an amazing experience! All that said, there are many people who are simply NOT positioned to start their own horse. In fact, I will bluntly say…Most people should not be starting a colt! It is a huge commitment in time, finances, emotions, patience, gentleness, and leadership. All that said, there is little other opportunities I have found in life that will bring more rewards!